Being a research student today means more than just the project itself, it’s all about developing your skills to help you be as effective as possible. The London Doctoral Academy (LDA) takes your development seriously, and today, when there is an increased emphasis on transferable skills, development training is very much part of a modern postgraduate programme. Our training programme and opportunities support the development of wider professional and personal skills, as well as the specialist technical requirements of your research degree. Students have opportunities to develop their skills and competencies in a range of areas, including research skills and techniques, understanding the research environment, research management, consideration of personal effectiveness, communication skills, networking and team working and career management. Read the LDA Key Skills Development Programme handbook (PDF File 1,385 KB). Building on a core Key Skills Development Programme, you will design your own programme supported by your supervisors and members of the London Doctoral Academy team. This forms part of a Research Skills Cycle that will support you through the life of your degree. Your professional development process starts with a self-audit to identify your existing skills, followed by an action plan to help you identify your development and training needs. Your record of the skills, courses and development opportunities undertaken forms an important part of your portfolio as a professional researcher. This is potentially valuable for a future employer, and is a unique feature of the London Doctoral Academy’s commitment to your professional development. You will be expected to attend the Academy's Key Skills Development Programme during the life of your degree, plus an impressive range of courses, seminars and workshops to help your wider development. 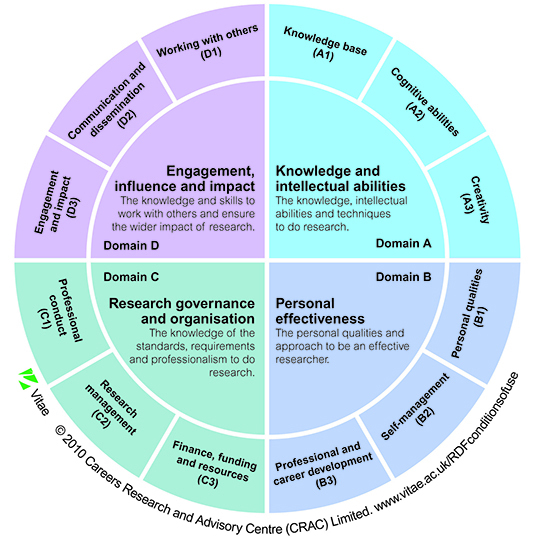 All of our courses are mapped to the nationally recognised Vitae Researcher Development Framework (RDF) which describes the knowledge, behaviour and attributes of successful researchers. The RDF structures researcher development into four areas: Knowledge and intellectual abilities; Personal effectiveness; Research governance and organisation; and Engagement, influence and impact. 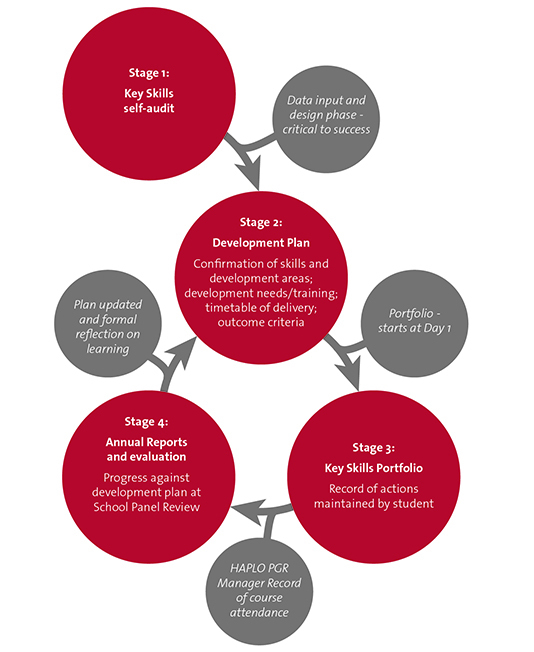 All our courses are coded to show which stage of your development they are applicable to, and which areas of the Vitae they contribute to, helping you design your own development plan. 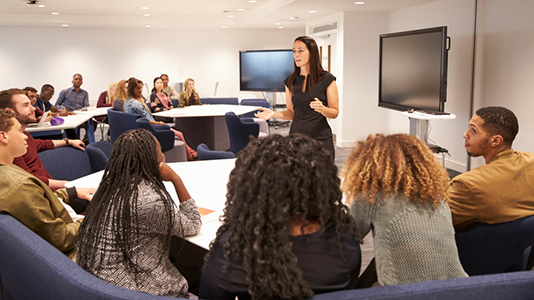 Our wider training programme has a mix of courses supplemented by specialist technical sessions for researchers from Schools and the Library and Learning Resources. You may find other University-wide resources useful, such as our taught Masters modules or the 6,000 Lynda online training modules available through the Library. You can read more about how the London Doctoral Academy supports personal skills development in our Student Handbook - Doing a research degree: the essentials (PDF File 5,301 KB).